plurality: 28,501 -- Nussle won in all 12 counties. Jean Pardee of Clinton is District Chair. The First District Committee consists of 56 people, 50 elected in the 12 counties and the 6 state central committee members. 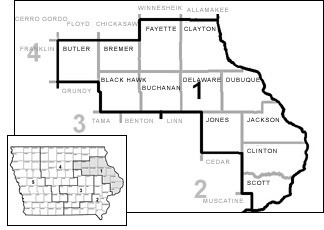 The number from each county varies--Black Hawk has 9 and a state central committee member, Scott 5 and a state central committee member, the smallest counties have 3. Included in the 50 are the county chairs or, in some cases, their designees.